Prior to the development of the science of modern Pharmacology, which explores the effect of isolated chemical substances in medicine and biology, diseases and injuries were treated using a mixture of medicinal plants, which were taken as infusions, ointments, lotions, enemas, lozenges and pills. Although the use of plants as medicines predates written human history, the first native herbal tract, which contains descriptions of 365 plant based medicines, is attributed to a man called Shen Nung, who is thought to have compiled it in China almost 4000 years ago. In the middle ages and during the Ming dynasty, Li Shih-chen authored a book called The Great Herbal, which contained a pharmacopoeia of over 1800 plant, animal, mineral and metal substances with their specific medicinal properties and applications, and which took him more than 27 years to complete. In the absence of learned scholars or well-stocked apothecaries, people living in rural and isolated conditions were reliant on local wisdom and treatment consisted of a mixture of ancient plant knowledge handed down through generations. Indeed all ancient civilisations have a rich history of using herbs as medicine, ranging from the Sumerians, who wrote the earliest surviving herbal prescriptions as far as 5000 years ago, to the Native Americans, who introduced the Swiss herbalist Dr Vogel to the wonders of the Echinacea plant. Paracelsus, a Swiss-born physician of the Renaissance era, who is credited with naming zinc and laudanum as well as founding the discipline of Toxicology and contributing to modern psychotherapy by being a firm believer that many diseases have their roots in psychological conditions, is also credited with having developed a formula known today as Swedish bitters. He called this herbal formula, consisting of a variety of bitter herbs, ‘Elixir Ad Longam Vitam’, or ‘Medicine for a long life’. In the 17th century another Swiss physician, Dr Claus Samst, rediscovered the formula and compiled a manuscript describing 46 conditions for which Swedish bitters can bring relief. He reportedly lived to the ripe old age of 104, dying in a riding accident (maybe the horse should have received the elixir too!) in an era when life expectancy was in the range of 20-40 years. 250 years later Maria Treben, who was to become a famous herbalist and author of the bestselling book Health through God’s Pharmacy, was given the drops after contracting typhoid fever in a refugee camp during the war, and was ‘miraculously’ cured of its after-effects after applying a compress containing the liquid to her abdomen for a day. She developed an abbreviated version of the recipe, calling it ‘Small Swedish bitters’ and wrote about her many experiences with prescribing it for conditions ranging from scars, wounds and cuts to pneumonia, indigestion, swelling and bruises, rheumatic pains, insect bites and insomnia. Although these claims may sound far-fetched and have little in the way of scientific evidence to support them, the herbs used in the formula do have a long history of improving digestion and having a positive effect on the liver, gallbladder, pancreas and immune system. 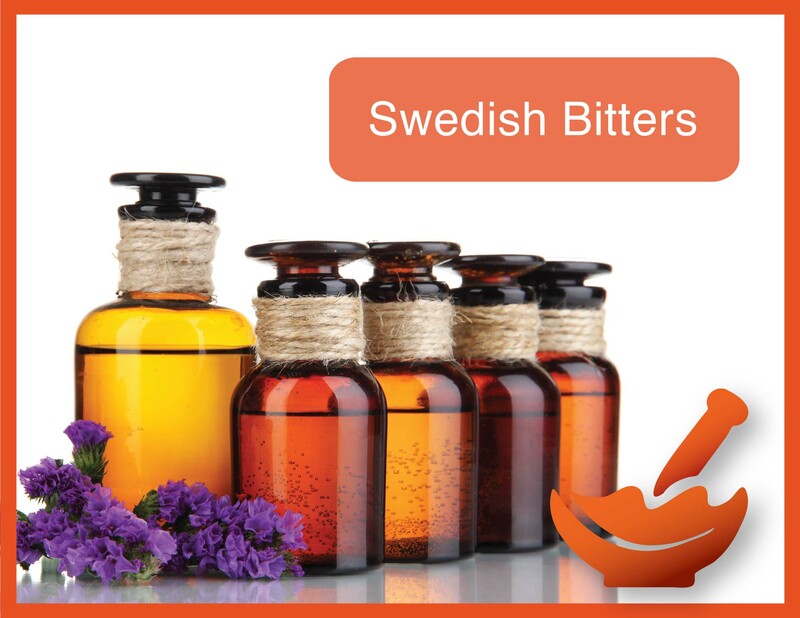 Swedish bitters is a valuable addition to any home medicine chest, providing relief for – amongst other things – constipation, bloating, heartburn, flatulence and other digestive discomforts (including nausea caused by hangovers), headaches related to digestive problems, rheumatism and gout. In cases of constipation, it is reliable without being harsh. It also increases saliva and gastric juice production and can help to improve appetite if taken regularly. Today, Swedish bitters is marketed all over the world and is available as a mixture of the dried herbs as well as an alcoholic liquid. It has a very strong and bitter taste and can be taken neat or with a little water or fruit juice, preferably half an hour before meals. Externally, the liquid is diluted and applied as a compress to the affected area after first applying cream or ointment to protect the skin and prevent irritation. Cuts, scrapes, bee stings, burns, rashes, scars, blemishes, boils and swellings are all treated in this way. *Not to be taken by pregnant or lactating women, alcoholics or those suffering from liver disease or anyone allergic to any of the ingredients. You can make your own Swedish bitters using a mixture of the dried herbs*, which is available in premixed quantities of 100g.The mixture is put into a 2 litre glass bottle and 1 1/2 litre of 38%- 40% alcohol – vodka works well – is poured over it. Leave the bottle in the sun on a windowsill or near the stove for 14 days and shake daily. Strain the liquid and pour into smaller dark glass bottles, seal and store in a cool dark place. It will keep for many years and will improve with age. The longer it stands the more effective it becomes. Shake well before using. To make your own Swedish bitter ointment or cream, a 50/50 mixture of the fresh or dried herbs is steeped in a glass jar with olive oil and left on the windowsill or in the sun for two weeks or more. The mixture is then filtered and added to an emollient such as Epizone A cream, lanolin or beeswax. When using beeswax, the oil is first heated and then the beeswax is grated into the mixture and blended well. Pour the cream or ointment into previously prepared glass jars or ointment pots and apply as needed.